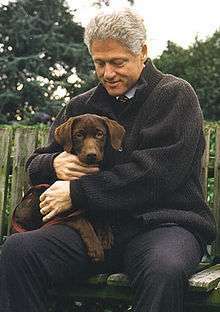 Buddy (August 7, 1997 – January 2, 2002), a male chocolate-colored Labrador Retriever, was one of two pets kept by the Clinton family while Bill Clinton was President of the United States. The Clintons' other pet was a cat named Socks. Clinton acquired Buddy as a three-month-old puppy from Caroline County, Maryland in December 1997. He named him after his late great-uncle, Henry Oren "Buddy" Grisham, who had died the previous June and whom Clinton often cited as a major influence on his life. Socks did not get along with the frisky Buddy, so the White House had to keep the two in separate quarters. Since this arrangement would be no longer possible in the Clintons' smaller home in New York, Socks was left under the care of Bill Clinton's secretary, Betty Currie. According to the police report, Buddy was killed by a car while "playfully chasing a contractor" who had left the Clinton home in Chappaqua, New York, on January 2, 2002. The Clintons were not home at the time of the accident; their home was being watched by Secret Service agents. The agents rushed Buddy to an animal hospital where he was pronounced dead. In 2005, Clinton acquired another chocolate Lab whom he named "Seamus". First Lady Hillary Clinton wrote a children's book called Dear Socks, Dear Buddy: Kids' Letters to the First Pets in 1998. It included excerpts from more than 50 letters written to the First Pets by children and more than 80 photographs of Socks and Buddy. 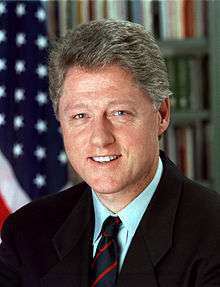 Buddy was a central character in Rick Cleveland's 2005 one-man show My Buddy Bill, relating the writer's fictional friendship with Bill Clinton, which began when both men discovered their common interest in dogs. ↑ Simon, Stephanie (June 25, 1997). "Henry 'Buddy' Grisham, 92; Clinton's Beloved Great-Uncle". Article Collections, Obituaries. Los Angeles Times. Retrieved March 29, 2010. ↑ Romano, Lois (June 27, 1997). "Returning to Hope for a Sad Farewell; Clinton Eulogizes Great-Uncle, a Father Figure Who Helped Raise Him" (fee required). High Beam Research. Washington Post. Retrieved August 4, 2012. ↑ "Former first dog Buddy killed by car". CNN. January 3, 2002. Retrieved March 29, 2010. ↑ Showerpets.com Archived August 17, 2014, at the Wayback Machine. ↑ Halperin, Mark (June 2, 2005). "Clinton Names New Dog Seamus: It's a Chocolate Lab Named Seamus". Politics. ABC News. Retrieved April 9, 2010. ↑ Jay, Reiner (23 Nov 2005). "My Buddy Bill". Archived from the original on 3 Dec 2006. Retrieved 31 Oct 2014. Noveck, Jocelyn (April 17, 2009). "This man is White House dog's best friend". USA Today. Retrieved March 29, 2010.